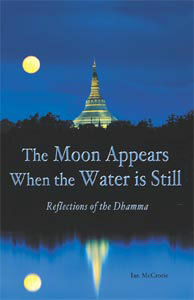 Culled from the Buddha's teaching, contemporary literature, and the author's own life lessons, this book is a gently humorous, powerful yet sweet gathering of story-poems, offered as a help when read or recalled at the time when they are most needed. Those practicing meditation may find refreshment, joy and a challenge to apply their practice in daily life; others may find an observant and empathetic voice in these lines. Click here for just the multi-format eBook (ePub, Mobi, PDF) for sale. Brief and interesting. The allegory is amazing. Simply beautiful, as well as thought provoking and inspirational. As a person who occasionally reads poetry of ancient hermits, monks, and nuns who have marveled at the changing beauty and suffering of life, I find this poetry to reflect those attitudes and yet be the voice of a lay person integrated into the modern world. With the right words and observations, Ian reveals gems of wisdom encrusted in the sand of the mundane world. He uses mindfulness cultivated through Vipassana to gently brush aside the sand so we can share his "aha." In this case we do not need to imagine ourselves with the ancient hermit, "somewhere on the mount, cloud-hidden, whereabouts unknown*," for this poetry brings it to life here and now. One of my favorite reminder tools. I enjoy flipping to a random page and reading the poem then beginning my meditation. Simple and inspiring. Sometimes thought provoking, sometimes plants a seed, but is always enjoyable.